Our conference has finished. We thank all our participants for this inspiring week! You are welcome to DFDE 2020! The photoalbum of the Conference will be published on the website later. The live Video Channel from the Conference Hall is launched! August 14 after the Reception party and August 17 after the Banquet, at 22:00, a bus will take you back to the hotel. We kindly ask all participants to register on Sunday, Aug. 13, from 1:00 p.m. to 6:00 p.m. whenever it is possible. The registration office will operate in Room 541, 5th floor, Faculty of social and humanitarian sciences, RUDN University, 10/2 Miklukho-Maklaya str. Please treat Monday, Aug. 14, from 9:00 a.m. to 11:00 a.m. as a reserve day for the registration because just two hours before the Opening ceremony cannot be enough to register everybody. Мы убедительно просим всех участников по возможности зарегистрироваться в воскресенье, 13 августа c 13:00 до 18:00. Регистрация будет работать в комнате 541 здания Естественно-гуманитарных факультетов по адресу ул. Миклухо-Маклая, д. 10/2. Пожалуйста, рассматривайте понедельник, 14 августа, 9:00–11:00 как резервный день для регистрации, поскольку двух часов до церемонии открытия не хватит, чтобы зарегистрировать всех участников. Dear participants! Your accommodation in Moscow is booked according to your requirements. Information letters have been sent to your e-mail, please, check your inbox. If you have questions, please response. The Banquet will take place on August 17 at 19:00. The price is lowered, now it is 2500 rub. Please, note that you should pay for the Banquet along with the registration fee. Please note that every day a free lunch will be offered to all participants in the RUDN University canteen in the Main Building, 6 Miklukho-Maklaya str. (see on the map). The Program of the conference is now available. The Book of Abstracts of the conference is published (pdf, 1.9 Mb). All participants will have their hard copy of Abstracts upon arrival. The Third Announcement of the conference is released. Dear participants, please, fill in the Registration Form at http://dfde2017.mi.ras.ru/reg.php if you have not yet done this yet. We have extended the period for registration until May 15, 2017. The Second Announcement of the conference is published. We expect all participants to fill in the Registration form and send us their abstracts and copies of documents required for official invitation (see the Second Announcement for detailed information). We have published the First Announcement of our Conference containing information about the organizers as well as confirmed list of 45-minute invited lecturers. 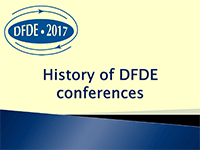 Also the Poster of DFDE 2017 is available. We announce The 8th International Conference on Differential and Functional Differential Equations. It will take place in Moscow, Russia, on August 13–20, 2017).